高薇, 蔡敦波, 周建平, 等. 嫦娥三号“玉兔号”巡视器行为规划方法[J]. 北京航空航天大学学报, 2017, 43(2): 277-284. 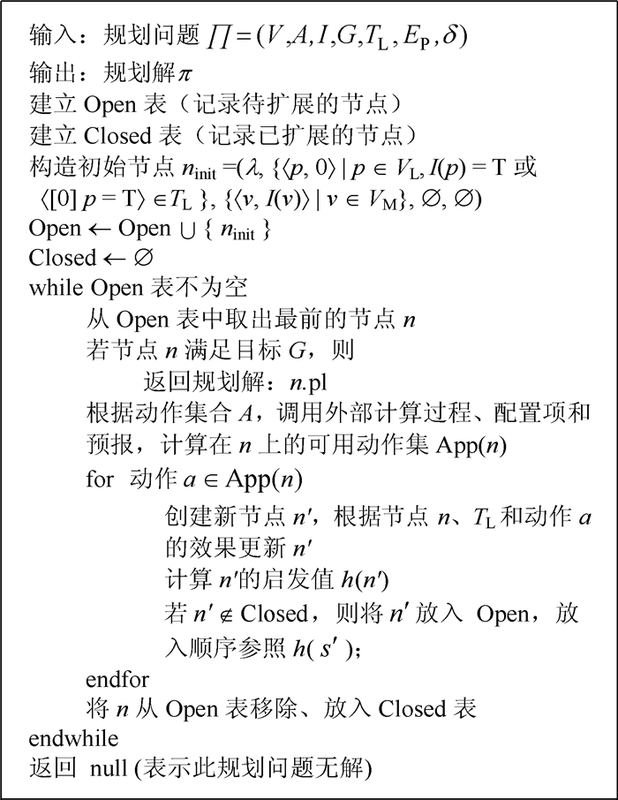 GAO W, CAI D B, ZHOU J P, et al. Activity planning method for Chang'E-3 “Jade Rabbit” rover[J]. Journal of Beijing University of Aeronautics and Astronsutics, 2017, 43(2): 277-284. Abstract: To enable the "Jade Rabbit" rover to plan fast in a dynamic work environment on the lunar surface, an activity planning model called temporal planning with dynamic duration and dynamic effect (TPDD&DE) was developed based on the automated planning technology of artificial intelligence. 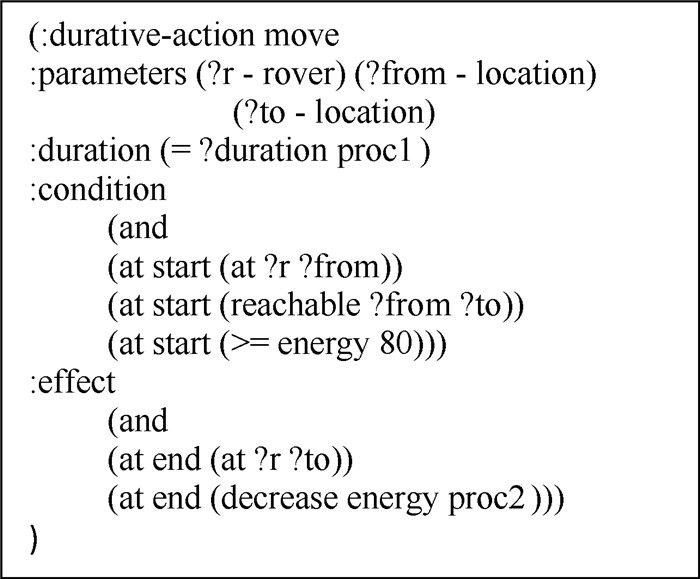 This model extends temporal planning to incorporate external computing procedures and to support durations of actions to be determined dynamically. To describe tasks of TPDD&DE, an extension of the planning domain definition language(PDDL), called PDDLDD&DE, was designed. A planning system that is based on the heuristic state space search framework was developed to solve the planning problem. By utilizing the "proposition Landmarks analysis" technique, we designed a heuristic function that accounts for reasonable orderings of actions' preconditions and is capable of getting better goal distance estimates for states. With the successful completion of Chang'E-3 mission, the proposed method played a key role in supporting the "Jade Rabbit" rover to fulfill its exploration tasks on the moon. IP W H, YAN J, LI C L, et al. Preface:The Chang'e-3 lander and rover mission to the Moon[J]. Research in Astronomy & Astrophysics, 2014, 14	(12): 1511–1513. HOFFMANN J.Everything you always wanted to know about planning[C]//KI 2011:Advances in Artificial Intelligence.Berlin:Springer-Verlag,2011:1-13. FOX M, LONG D. PDDL2.1:An extension to PDDL for expressing temporal planning domains[J]. Journal of Artificial Intelligence Research, 2003, 20	: 61–124. CAI D B,HOFFMANN J,HELMERT M.Enhancing the context-enhanced additive heuristic with precedence constraints[C]//Proceedings of the 19th International Conference on Automated Planning and Scheduling (ICAPS).Menlo Park,California:AAAI Press,2009:50-57. HU Y M,YIN M H,CAI D B.On the discovery and utility of precedence constraints in temporal planning[C]//Proceedings of the 25 th AAAI Conference on Artificial Intelligence (AAAI).Menlo Park,California:AAAI Press,2011:1788-1789. RABIDEAU G,KNIGHT R,CHIEN S,et al.Iterative repair planning for spacecraft operations in the ASPEN system[C]//Proceedings of the 5th International Symposium on Artificial Intelligence,Robotics and Automation in Space.Noordwijk:ESA Publications Division,1999,440:99-106. BARREIRO J,BOYCE M,FRANK J,et al.EUROPA:A platform for timeline-based AI planning,scheduling,constraint programming,and optimization[C]//Proceedings of ICAPS 2012 Workshop on Planning and Scheduling with Timelines.Atibaia:ICAPS,2012:6-7. SMITH D E,FRANK J,CURSHING W.The anml language[C/OL]//Proceedings of the ICAPS 2008 Workshop on Knowledge Engineering for Planning and Scheduling (KEPS).Sydney:ICAPS,2008[2016-08-13].http://ktiml.mff.cuni.cz/~bartak/KEPS2008/download/paper07.pdf. GEREVINI A, SAETTI A, SERINA I. An approach to temporal planning and scheduling in domains with predictable exogenous events[J]. Journal of Artificial Intelligence Research, 2006, 25	: 187–231. EDELKAMP S,HOFFMANN J.PDDL2.2:The language for the classical part of the 4th international planning competition[R].Freiburg:Albert-Ludwigs-Universität Freiburg,2004:1-21. GEREVINI A,LONG D.Plan constraints and preferences in PDDL3[R].Brescia:University of Brescia,2005:1-12. DO M B, KAMBHAMPATI S. Sapa:A multi-objective metric temporal planner[J]. Journal of Artificial Intelligence Research, 2003, 20	: 155–194. EYERICH P, MATTMVLLER R, RÖGER G. Using the context-enhanced additive heuristic for temporal and numeric planning[M]. Heidelberg: Springer, 2012: 49-64. HOFFMANN J, PORTEOUS J, SEBASTIA L. Ordered landmarks in planning[J]. Journal of Artificial Intelligence Research, 2004, 22	: 215–278.